Collegedunia.com is an extensive search engine for students, and parents who are seeking information for higher education in India and abroad. One can trustthe information provided on Collegedunia as they claims to have a good team of content developers who are devotional towards their work. The web portal provides most brief and relevant data on colleges and universities. The portalhas several unique sections giving students an option to check a range of information from admission details, fee structures, course details, cut-offs, placements, entrance exams, seats availability, reservation and many more. Collegedunia has been exclusively launched to meet the needs of a candidate who wanders here and there in search of admission for higher studies across the country and abroad. Here Collegedunia gives them an alternative option which is just one click away from them. Here are the salient features of Collegedunia through which it is catering the educational needs of students and parents. • User-Friendly and well Organized Interface:The interface is great and helpful in providing the accurate and smooth results. All the information is well organized and perhaps this is the best feature what the website is offering. Navigation between different pagesis easy & smooth. • Placements & Job Information:This feature just differentiates Collegedunia from its rival portals. Majority of the students & parents are in dilemma at the time of admission with the concern of placement through the college. Collegedunia has taken care of it effectively and has provided the details of the past placement details of the college. It also lists the top recruiters in that college. This data brings in the “Trust Factor” & enhances the information available on the website. • Detailed insights of college facilities:the portal gives detailed knowledge of the facilities available at the campus of every college like Gym, infrastructures, Labs etc. • “Featured Colleges” Section:“Featured Colleges” section is an option where one can find the latest updates about some of the top and most reliable colleges in the country. Based on ranking, this section gets updated giving the best information of some of the top ranked colleges in India. • “News” Section:This section gives the information related to entrance exams like dates, centers, application procedure, syllabus, etc. Started in July 2014 with just littleinformation about few colleges has now detailed information of over 15,000 colleges and exams like CAT, MAT, GMAT, GATE, etc. With external funds coming in from Gaadi.com CEO Umang Kumar, they are planning to expand their reach to 30,000 colleges and cover all the entrance exams by the end of this year. The startup now witness more than a lakh visitors per month which is less in comparison to their competitors, but about 40 per cent of their traffic is direct, which they feel is higher in comparison with other players. The main source of their revenue is the paid advertisement where colleges and institutes can advertise itself over the platform which helps increase the visibility of their listings across the website.Apart from this, they also work on Cost PerLead(CPL) model. They share the information of the students with the college and generates revenue on the basis of CPL. They also have an option for students to apply to those colleges, and on each application to that college, they receive a CPL from the college authorities. Collegedunia few months back launched its exam sectionover the portal where latest posts related to entrance exams in India like deadlines, application process are provided. It also provides free sample papers, tips, counseling and result advice. Right now the feature is in beta version. They are also planning to launch new features such as institute listings, personalized notifications, authentic alumni advice talks and college reviews. They are growing at 20%MOM in terms of visitors. Currently, it has 60 employees across content, technology, call centre, email marketing and sales departments and has quick plans to hire 40 more minds in the coming months. In the coming future, the portal will include the details of coaching institutes, and polytechnic institutes too. 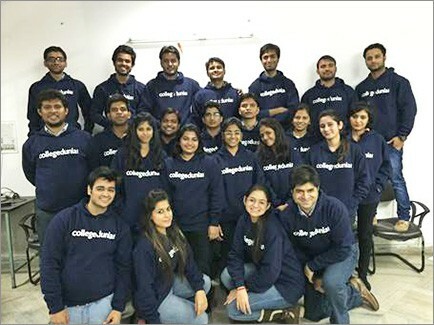 According to Mr. Sahil Chalana, founder of Collegedunia, their aim is to become the Zomato of the education industry.